Pomurje Museum Murska Sobota, acting in an area where four state borders join - Slovenian, Austrian, Croatian and Hungarian - can present a lot of stories and connecting projects. It displays connections between museums as institutions, between programs, between typical cultural heritage and traditional elements, between collections, projects in which it has been or still is cooperating. However, there are not many stories like the one about the old town Radgona/Radkersburg and the two museums, which, with help of their collections, keep it alive for the public. The area of Radgona was already settled in prehistory. The border between German and Slovene ethnic identities was fixed here in medieval times, and the town itself bloomed, due to its strategic position on the river Mura, on the border of Austrian lands and the Hungarian kingdom, as well as itsrich vine growing area, exporting goods to important civil and church courts of that period. The old Radgona/Radkersburg is combined of an inner town on the island of the Mura river, of the suburb on the right river bank named Gris/Gries and of the hill which contains the location of the earliest settlements and the feudal estate named Gornja Radgona/ Ober Radkersburg. This all was one town till the Austro –Hungarian monarchy fell to pieces. After World War I, the peace treaty defined the new state border on the river Mura and the old town became part of the Austrian state, while the suburb with the castle hill became part of the Kingdom of the Serbs, Croats and Slovenes, afterwards named Yugoslavia. Since 1991 this area has belonged to the Republic of Slovenia. The new town on the right bank of the river took its name after the castle Gornja Radgona. The state border has left in the hinterland of Austrian Radkersburg villages with a majority of Slovene residents, and in the hinterland of Slovene Gornja Radgona villages with a majority German population. The first group have been officially acknowledged as minority from 1955, but have received some cultural minority rights only in the last two decades. The others were forcibly expropriated and ejected into Austria by the Yugoslav government after the World War II. In the 1960s Radkersburg was renamed Bad Radkersburg and turned into a blooming tourist town due to a preserved and renovated cultural-historical core and thermal water. Gornja Radgona has vegetated with a lack of identity,until in the last decades local enterprises have made breakthroughs, leading to the town becaming the economic centre of its surroundings. 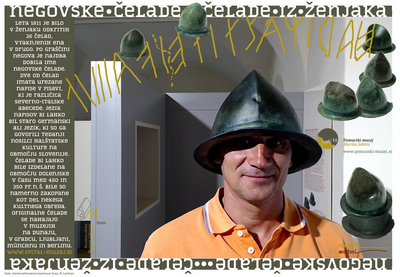 Based on the history of a once single town in one state and today’s two towns in two states, two museums - the Museum im Alten Zeughaus and the Pomurje Museum -built two collections, opened two permanent exhibitions, told two stories in their own way, which together form one whole story. 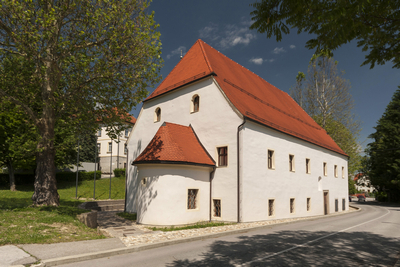 Both collections are hosted in historical houses, the Austrian one in a former armoury and the Slovenian in a former medieval hospital or shelter. That’s why they are both important parts of the town’s past and the museums’ stories. The Museums offer visitors joint tickets, guided tours through both exhibitions, as well as through historic parts of both towns in two languages, and why they are preparing new joint programs also in cooperation with Pavel Haus- the cultural center of Slovenes in Austrian Styria, located in the nearby village of Laafeld/ Potrna. Our project began with a comprehensive renovation of the monument house- the old Spital - and setting of premises for visitors. The Gothic cellar was equipped for receptions and tastings of prestigious Radgona wines. In the Renaissance Hall, which is intended to host different cultural programs, events and weddings, the collection of works of art from the eighteenth and nineteenth centuries are exhibited. The project continued with the opening of a new permanent exhibition titled Radgona bridges, awarded in 2015 with the highest Slovenian award for museum projects. The title Radgona bridges was chosen because the story about Radgona is always a story about the bridge. The bridge across the river Mura, which used to link the ancient town with its suburb,was burned down, flooded and rebuilt many times. In 1945 German army blew it up to stop the advance of the Soviet army. Seven years passed before the two states, with British mediation, agreed to build a temporary bridge until the presidents of both states together opened the new one in 1969. Today’s border on the bridge is just administrative and the bridge connects two towns and two countries as a wide open space for socializing and dialogue. But it is not just the architectural structure which acts like a bridge: the Radgona bridges exhibition galleries are bridges to the oldest past of the area, evidenced by the prehistoric and early medieval remains, to the family and political history of the town and its environs, between the urban and suburban inhabitants, between vineyard owners and vine dressers, through political, economic, and human falls and rises. The Radgona bridgesdisplays are also bridges between church history and popular beliefs, bridges through man's life from birth to death, between the two ethnic and linguistic communities that have lived in this area since its settlement. They are bridges between the Slovenes and Germans, who have been capable of burning all bridges between themselves in the process of national awakening, horrible wars, and retribution, but have been equally capable of rebuilding and maintaining them. Through the exhibition we can follow films with different personal stories: memories and current reflections on the life of the local population along the border, the native Slovenian student who goes to school in Austria or the Slovenian brewer who has a brewery on one side of the border and a pub on the other. A local politician of the nineteenth century wrote: “We didn’t feel like Germans nor like Slovenes, because till 1848 no-one cared about that”.However, an American study commission leader for border setting in 1919 wrote: “A curious phenomenon of this borderland between the Slavs and Germans is that names mean nothing. In one town I visited the man representing the Slav side had a distinctly German name, and the German representative had an equally good Slav name. It is difficult to say what constitutes nationality. Language is not a test, for they are mostly polyglot. There is nothing about the personal appearance of the people or the built of their towns that proves one contention or the other”.In the exhibition one can find a wine press beam from 1871 with this text: ”Long live Slovenes and Germans and all, who helped building this wine press, the diggers, pickers, carriers, pressers and all neighbours long live.” One and a half centuries ago this writing called upon us to live together. In between we survived bloody wars and social revolutions and at the end of complete human breakdown decided to live as even and equal. Today the museum offers us the possibility to openly face up to our past, to socialize, play and weave our future together. Not just for Pomurje Museum, but for two museums in two towns and two states, our collections are tools to tell stories about the common past and present, stories of bridges, muses and art masters, but most of all of the common historical memories of people living here. We are confident that in two neighbouring museums the community’s memory is in good hands and together with it our common past. We hope, of course,that so is our future.